My dad, being of Swedish ancestry, thought it was a good idea for our family to "raise" a Swedish breed. He asked us to research dogs outside the AKC. That is where I came to the world of Swedish Vallhunds, by way of a page in a book, a book that showcased “rare” breeds from all over the globe. The description of a good family dog, a farm dog, and herding breed, who could also chase rodents and varmints off the farm, sounded perfect. Coupled with the fact that this breed was from the land of our forefathers, we were convinced to go to the Internet for further study. Everything we found drove us closer to finding this amazing little cattle/farm dog from Sweden. Blaze was named in honor of UKC CH Kirkholme Oskar “Blaze” who had sadly passed on the day our boy puppy was born. Cindy Kingsley the breeder, asked the owner of this dog, Marg, if she could name the boy puppy in her litter after this amazing legend in the Vallhund world. Marg said yes! Blaze came to live with us in December of 2001, and about a year-and-a-half later a lovely little red stub-tailed female came to live with us from Canada. Ulla Gamberg was her breeder and called this her “Storm” litter as they had been born on a wild and stormy night in Canada. I flew to her farm in Ontario to bring home Vastgota Stormy Sky, our little “Skye” girl. Our family soon grew again with the addition of another little red-head named Umanoma Maijapoppanen which means Mary Poppins in Finnish. Yes, she came from Finland! Uma Aaltonen had decided that her first born girl puppy would be "betrothed" to my Blaze, so she brought "Maija" to live with us. Blaze’s first litter was with Aros Adorable Amberley, owned by Ingrid Low, and arrived on January 25th 2005. We had three boys. Our involvement in the breed has grown, and Ingrid, being from Sweden has been a great mentor, as has Cindy Kingsley. 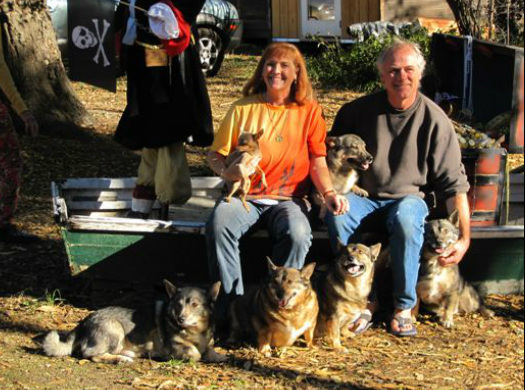 Ingrid and I hosted the Swedish Vallhund National Specialty here in California in 2004. I also chaired the 2010 National Specialty with my dear friends Ingrid and Maria Gunderson. We have had several amazing wonderful litters here at Solborg Swedish Vallhunds. Each puppy is a special little jewel that we place in only the most perfect of homes. We are proud every puppy is living in the most loving home imaginable. We have kept two Solborg pups here on the farm: CH Solborg Lady Eowyn, and Solborg Frodo Baggins. In time, we began to show our dogs not only in performance but in the breed ring as well. We have such a great time treating shows like a fun picnic outing with the dogs, that many of our puppy owners have joined us. Through these adventures, we have been honored with 11 Solborg AKC Champions and four Solborg AKC Grand Champions to date. Having our enthusiastic puppy owners actively showing their dogs has resulted not only in champions and grand champions but several performance titles as well. We are very proud that our dams, Skye, Maija and Eowyn have all been honored with the title Register of Merit. Having Blaze as my canine partner has introduced me to a whole new world of performance. Together we have become involved in agility, stock dog training, Canine Musical Freestyle, Nose Work, rally obedience, conformation showing, and back packing. We have traveled all over the country competing and performing but most importantly making new friends and sharing our love of performance sports. He has literally changed my life. As you will see on the training page, I am a dog trainer, utilizing the method of “Clicker Training.” All of my dogs are clicker trained from the very beginning. Dogs excel in learning through positive reinforcement and we even start each little Solborg puppy out with operant conditioning using Clicker Training. It is so wonderful that the pups "get it" so fast! Swedish Vallhunds have rocked my world. I can’t imagine life without my special boy Blaze, or any of our wonderful Vallhunds here at Solborg Farm. Life with a Vallhund is great!